I finally got it finished. It wasn’t a difficult design. It was just a very large quilt and I had lots of distractions. I did meandering paw prints in the background. Stitch in the ditch around all the dogs and cats. Four designs on the four borders. The design on the light outside border is a simple swag. Between my throat hurting and 3 phone calls from my mother I didn’t get much sleep last night. My mother wants me to call the FBI, the CIA, the congressman, local police, adult protective services (APS), and any other officials she can think of to get them to investigate the nursing home for abuse. When I refuse to make the phone calls for her she tells me she will call them herself….. and she does. For someone so feeble she sure has a very sharp mind for remembering phone numbers. I feel very sorry for the nursing home staff. It can be very unnerving to have the FBI or some other officials show up out of the blue to investigate allogations of abuse. I know…. I’ve had it happen to me on several occasions over the years. It happened to the staff yesterday. The FBI was there because my mother called them. I had to reassure the director that it was not me who made the phone call. It was not me accusing them of abuse. The next few weeks are going to be hell for me. My mother has had so many years of practice at what she does that she can create a nightmare for everyone around her. To be quite honest…. I simply don’t want to deal with her anymore!!! I’m tired of the stress of trying to explain to her what she can’t do…… and she says “Why can’t I? I know my rights!” and does it anyway. I’m tired of officals calling me or showing up at my door to tell me to “do something with your mother”. I want a parental divorce! 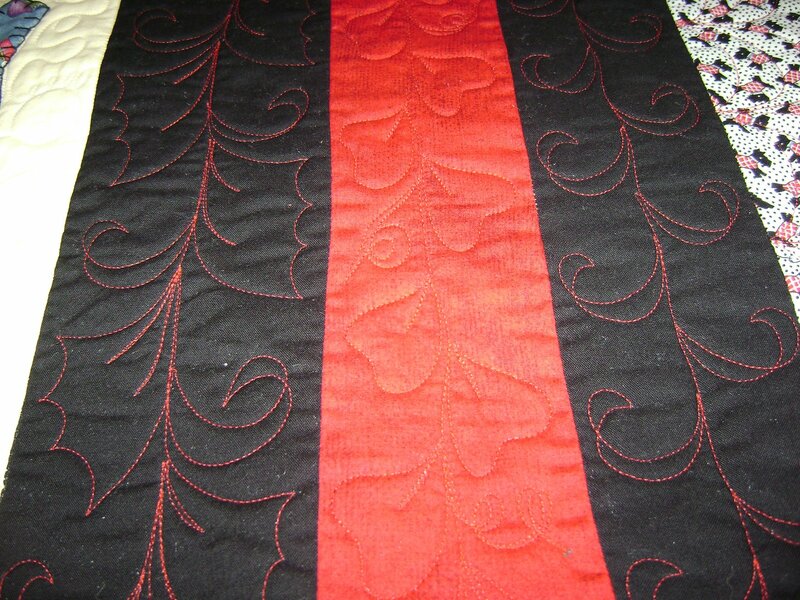 I’m headed to the studio to start the next quilt. I wonder how long it will be before I get another phone call from another official? Who will it be? FBI? CIA? Sherriff? APS? Police? Ooooooooh, my heart goes out to you. I have dealt with difficult mother and MIL. And mentally impaired adult daughter. All now in heaven. It is so trying. Email me any time you need to talk. Or vent. I’m here. Is that a freudian slip on the title? Dog “guilt.” Hahaha. I’m so sorry about your mom. That particular mental illness is a toughie. To put it mildly. Take care. Oh Anita, I can only imagine the stress load you are under. I am so sorry. I can see my father behaving the same way if he were still alive. I soo feel for ya friend. hang in there,, yes “out of state location” just MIGHT be the best thing for BOTH you and your mother. 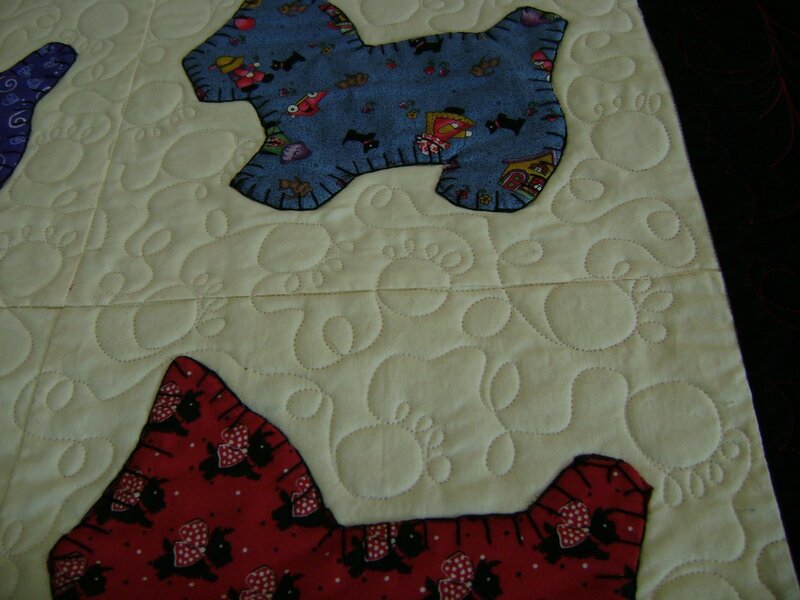 Love the pawprint quilting on the animal quilt. Soooooo cute. Sounds like your mother is a piece of work, illnesses or no. Guess when you get the phone calls just tell them straight out you aren't responsible for you mother's actions & you don't want to hear about it. If they feel she's a problem, they can take her in & see how they like dealing with her. Too bad we can't choose our families, I guess. Keep your chin up, it'll all work out somehow. 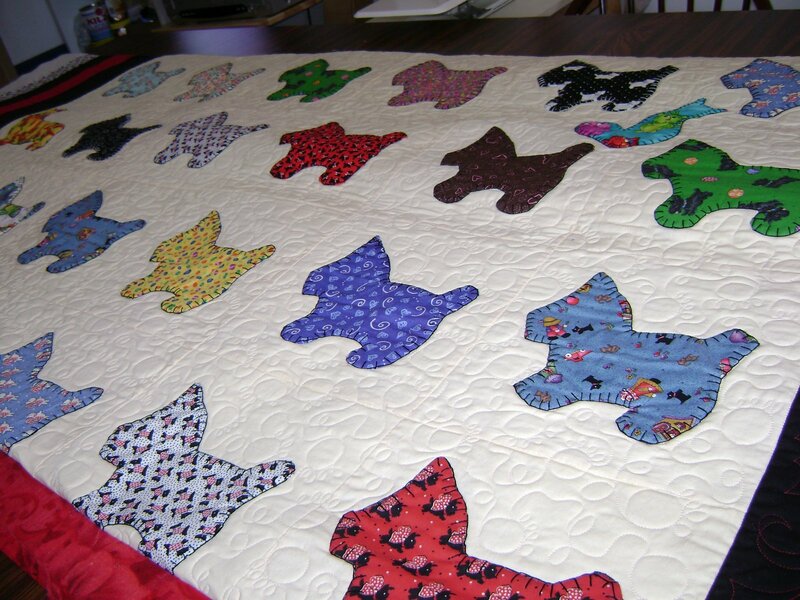 This entry was posted on May 8, 2009 by Anita in Quilts of 2009.